I’m reminded of this same incongruity every time I read about some person in the media trying to ‘debunk’ some procedure or other. The most recent article in the Toronto Star celebrates how people like Tim Caulfield help the public by debunking celebrity culture. They perceive themselves to be ‘myth busters’, but in reality, they are selling the same pseudo-science they pretend they are ‘debunking’. Mythbusters was a long running show on television which would take a myth or saying or internet video and then proceed to perform extensive scientific testing to determine whether this myth was busted or confirmed. They would often spend weeks and thousands of dollars performing as rigorous experiments as needed. Most of the people online pretending to be ‘myth busters’ are just people who scream for attention and don’t perform any real science. They are simply trying to yell louder than the person they are trying to debunk. What is needed to actually, scientifically debunk this claim? You need to gather a group of, say 100 women, and have half use a jade egg, and the other half use, say, a stone egg of the same weight. You would not let the women or the researcher know which egg they are using and then measure their sexual energy at some later date. 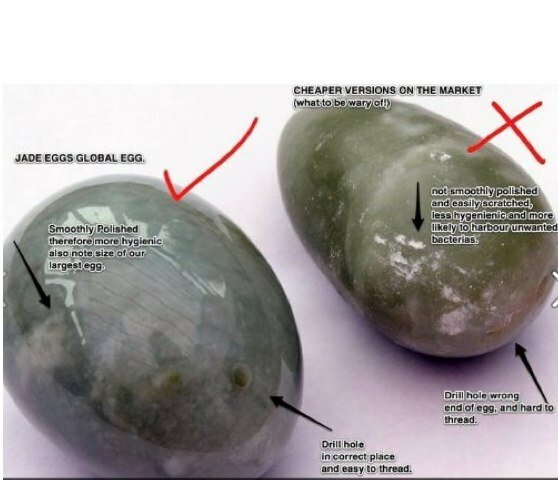 If there is no difference, then, and only then, can you claim to have successfully debunked the jade egg. Did Tim Caulfield do any of these rigorous studies? Did Tim Caulfield carefully monitor a group of women who purchased the egg over several years and ask them if their sexual energy increased? Did Tim Caulfield perform a survey of jade egg users and compare them to a control group of women matched for age and see if there is any difference in sexual energy? Hardly. These studies actually take time and money. Tim Caulfield has done nothing of the kind. He values his own opinion as scientific and other’s opinion as just bunk, which allows him to denigrate others who are making some claim he disagrees with. He is doing exactly the same thing as Goop. Making unsubstantiated claims. That’s hypocrisy. I have nothing against Tim Caulfield, who I’m sure is a nice guy, I just hate intellectual hypocrisy. Recently the US News came out with its annual ranking of ‘best diets’ from the ‘experts’. 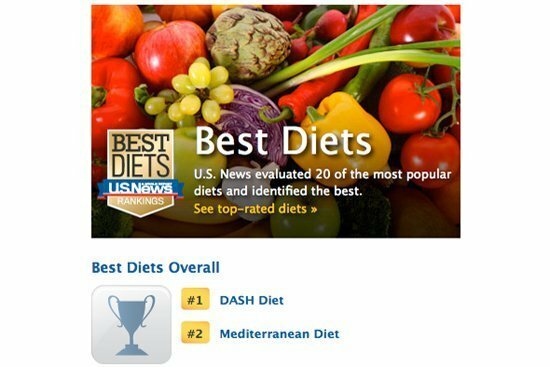 The highest ranked diet (DASH) is the same one you would expect to see in any mainstream publication, and not very different from the diets recommended by most physicians and dieticians. Cut your calories. Cut your salt. Moderation. Yadda yadda yadda. How’s that working out for us? Exactly. The words ‘obesity crisis’ comes to mind. Diets are constantly derided as ‘fad’ diets without any evidence whatsoever. Intermittent fasting, for example, is now derided as ‘dangerous’and potentially causing diabetes. Yes, eating nothing, which rests the pancreas (an organ involved in digestion) will damage it. I also cause wear and tear on my car as it sits in the garage. Right. Fasting – literally the oldest dietary intervention known to mankind is a dangerous 2000 year old ‘fad’ promoted by ‘shills’ like Hippocrates (father of modern medicine), Benjamin Franklin, Buddha, Jesus Christ and the prophet Mohammed. Right. What is usually lost in these sorts of rankings, though is the absolute, #1, most important question you must ask yourself for any diet. “How’s that working for you?” I’m not talking about some quest for ‘personalized medicine’ or ‘Eat the diet that is best for you’ nonsense. These sort of cop-out answers are not helpful because if we don’t know the best diet overall, how are you going to know the best diet for you? Similarly, personalized medicine is mostly just pie-in-the-sky fantasy rather akin to developing colonies on Mars. It’s great to sell product, but not great if you are counting on it to keep you healthy. For example, do we personalize the need for aspirin after a heart attack? Do we personalize the need for blood pressure control based on your own genetic makeup? Do we personalize your ideal body weight based on your family history? No, no and no. Indeed, the entire field of evidence based medicine contradicts this personalized approach. Randomized trials, the gold standard of medical evidence is based necessarily on large groups of people, and are distinctly NOT personal. Hormone Replacement Therapy – Millions of women given HRT in the mistaken belief it would reduce heart disease. Instead it caused blood clots and cancers with no benefits. All three are examples that I recall vividly because I was taught in medical school about the benefits of all 3 of these widely accepted therapies that turned out to be extremely harmful to health. My mother was given hormone replacement therapy, which significantly increased her risk of breast cancer and heart disease. Where were the ‘debunkers’ when it comes to conventional medical advice? They are certainly loud enough when trying to prevent you buying a jade egg, but are nowhere to be heard when trying to actually save you from proven harm from the medical profession. This is what I consider the greatest hypocrisy. The ‘debunkers’ pretend they are doing this to protect consumers from wasting their money on useless treatments. But what about the millions of dollars that are funnelled into paying doctors? Not a peep. What about the complete corruption of academic medicine? What about the fact that the doctors writing guidelines are taking hundreds of thousands of dollars from the drug companies? Not a peep. The reason people turn to alternative medicine is that they have a (correct) suspicion that doctors are simply pushing the ‘establishment rules’ and trying to sling mud on everybody else. We need to spend more time ‘debunking’ harmful stuff we currently do, like the disastrous dietary advice of counting calories, eating 6 times a day, never skip a meal, avoid intermittent fasting, always eat breakfast even if it is a highly processed sugar-laden cereal bar etc. and less time worrying about some largely harmless jade eggs. Doctors need to earn back the public’s trust. I’m scared of my drug lord..ahem, I mean ‘doctor’s as well. And the latest thing they are doing is saying you will lose your insurance if you don’t submit to your doctors orders. For example, if you refuse statins. Fill out the ‘script….don’t take the pills. Easy. Yep. I recently got “fired” by my doctor. Why? Because I called her out for giving advice that clearly showed that she hadn’t bothered to give 2 seconds to the extensive patient history I had filled out. She stated that she could not do it because she has 600 patients. Amazing. And she couldn’t admit messing up and cutting corners, nope, she wasn’t able to admit screwing up and instead got rid of the horrible patient who actually expected her to do what she is paid to do. The profession is fundamentally corrupted by the monopoly granted by the State. Really liked this post. Calling out both sides is becoming extremely important these days as it seems people tend to argue from an emotional standpoint instead of looking at the data. This story https://www.afp.com/en/news/2265/world-faces-staggering-obesity-challenge-study-doc-1590mi1 came out yesterday regarding the increasing worldwide obesity epidemic, yet there is nothing mentioned about how to address it other than “individual countries must work on the best strategy for them”. It seems the general thinking is that people just aren’t following the advice they are given, when the evidence clearly shows the opposite. The problem is that the advice is bad…. Spicy! Avoid small planes sir. Good science, but bad history. A majority of historians would paint a much different picture of the crusades. yes the crusades were a result of Muslims destroying and taking over Christian churches and holy sites and destroying them or turning into mosques,sound familiar? Thank you for that comment, Tom. I will forgive Dr. Fung because he is relatively young and, therefore, has been subjected to revisionist history in his education. 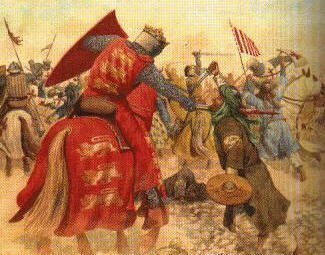 The Crusades were defensive battles waged against mohammedans who were attacking the holy sites of Christianity and assaulting and murdering Christian pilgrims who came to the Holy Land. FWIW, they did a number on the Zoroastrians in the Sassanid (Persian) Empire too. In the early Arab conquests, they were content to leave Christians and their churches in peace as long as the Jizya was paid. Without angioplasty I’d be dead you disingenuous cockwomble. If you have a problem with the second point, take it up with God. I don’t think he was referring to emergency stenting, which of course has saved many, many lives. Also, “cockwomble”, I may have to borrow that in the future. I read The Guardian’s article when it came out, too. Have you shared your thoughts on some of the specific claims yet? I’d love to hear how you would debunk those warnings.. although I do have to say most people in the comments did seem skeptical of the study! Sorry Dr. Fung, but that was the worst and unhistorical first paragraph you’ve written. Have you ever wondered why the ever conquering Muslims from that era did not over run Europe? The Crusades stopped their military advance and were an attempt to push them back. Peter Lavoie: Opinions may vary on those issues. All due respect to the good doctor, historical facts are not in his medical wheelhouse and should be avoided if he can’t get them straight. The Crusades began only in response to 400 years of unremitting Muslim attacks & persecution of Christians throughout the former Roman Empire. Fact, not opinion. Stick to medicine sir! Thank you for that, Peter. I am not a Catholic and do not agree with the Catholic doctrine so, my horror at reading that first paragraph had nothing to do with any bias toward Catholicism. I was horrified to read that people still believe the lie that “The Church” went to “convert” innocent Muslims!! It was a Caliphate – a holocaust against Christians and Jews – that the Church was trying to stop. And thankfully, they did. For more info, start with Brigitte Gabriel’s “1400 Years of Islamic History in a Few Minutes”. Ah, the wonderful, subtle, voice of reason. Dr. Fung, if you ever run for Pres in the USA, I will not only vote for you, I will give my time for your campaign. On a separate note, in the first 3 months of this year, I lost 30 lbs. eating one keto meal a day. In my entire life this is the only time I have ever had control of my weight. I will never have weight problems again. Thanks for everything, and I wish you all the best from Austin Texas. SGS, I would love to support each other since you are in ATX like myself! When their recommenation is to eat lots of whole grains, I know I don’t have to read any further. Why? There will be multiple to defend each point. You will still believe whichever one confirms your own bias so why would I waste my time? You should look into the „null hypothesis“. There is a difference between saying „not X“ and „I reject X until proven“. I do not agree with your rundown on HRT. 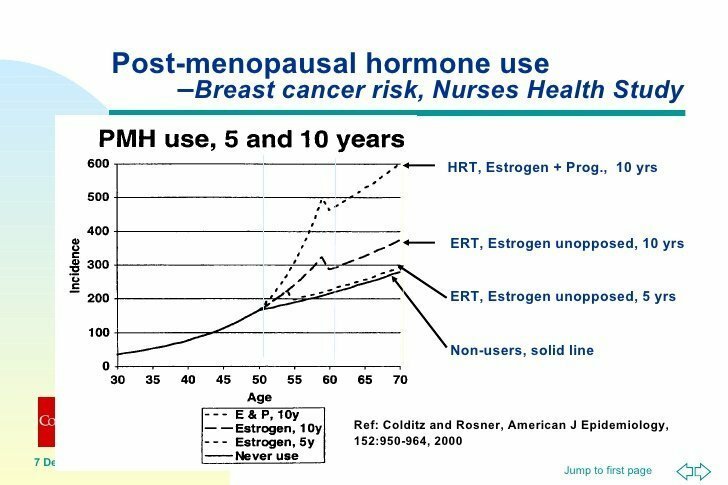 3 of the lines on the graph are referring to ONLY estrogen therapy, which is very dangerous when unopposed (ie: given the necessary progesterone). But the top line shows both hormones. It’s a little like comparing apples and oranges. I think this required a full story on hormone replacement now that people are (or should be) more confused. Let’s debunk this graph. Dr. Fung blames the obesity crisis on the DASH diet. Where’s the evidence? Well, probably not ALL of the obesity crisis. Please don’t wump me, I’m saying this in a mildly amused voice. It’s also colossally stupid of Fung to compare fasting to leaving your car in the garage. Unlike the car, the body’s motor never stops running and fasting – especially long-term fasting – can cause liver, kidney, and heart damage, excessive ketones and cortisol, and even death by hypoglycemia for diabetics. Who gave this man a medical license? Having said that, I will grant you that a better analogy would have been to compare a car idling at a stop light with one racing around at top speed. Which one incurs more damage? Does idling your car cause wear and tear? Of course. Does idling your car cause more wear and tear than a car racing around at top speed? Hard to make that case. Fasting is stressful; it’s more like a racing engine in a stationary car. Good way to overheat the bushings and throw a rod. You should try fasting before you comment on it. You need to lose some weight and how are you going to do it? Richard, Fasting is not necessarily Stressful. I’m not at all Stressed when Fasting. I would like to see the Blind studies and results on this, statement Please. Gandhi. And wasn’t his fasting powerful? Wasn’t that simple man powerful himself? Completely in agreement that long term fasting can be very harmful. Too many elements that need to be accounted for. Many of the documented cases of non diabetic ketoacidosis are a result of fasting wether intentional or unintentional. Short term fasting, less than 36 hours, can be dramatically beneficial but anything longer needs to be supervised by ampeofessional to ensure all needs are met to avoid complications. Who gave you a medical degree? You obviously know nothing about long term fasting. One would imagine he might of seriously thought there may be a genetic/ familial reaction.but in 7- 10min consultation he most likely missed that and in effect perhaps killed her ! Stop spreading anecdotal evidence. HRT does NOT cause ovarian cancer and it is not associated with growth of tumor in patients with ovarian cancer taking hormones. So frustrating how much time I spend undoing these ideas in my clinic. Women’s health is so misunderstood. Dr fung has generally useful advice but occasionally bad examples. The CDC has published opioid Rx rates through 2017. You can look up yourselves. Rates are substantially down even at VA…..ALMOST 40%. However cheap fentanyl from Mexico and China smuggled into USA at astronomical rates and amounts. SOME drs have proceeded recklessly……but let us all understand the facts. The fentanyl is often cut with heroin, meth, and some legit meds. 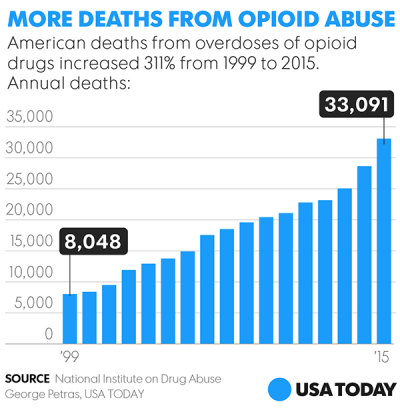 The fact is that rx is now highly regulated and we have substantially an illegal drug trade…..at least for now. Great article.. like your not letting critics run there mouth without a response. My hat’s off to you for the details pointing out the inconsistencies in Dr Fung’s analogies. I can’t help but wonder what is really bothering you, that Dr. Fung is a little too casual about his analogies, or that you can’t really dispute the science behind his recommendations? My initial comment was on Fung’s claim that the DASH diet created the obesity crisis. If you can kindly show me some evidence for it, we can leave the analogies and the faux-historical framing behind. It’s typical for anti-carbers to invoke conspiracy theory to do the work for them that science won’t do. BTW, Kevin Hall has debunked Fung. Lovely blog post; I especially liked this line: “The award-winning science journalist Gary Taubes believes that obesity is essentially a disease of too much insulin – hyperinsulinemia.” There’s nothing like a journalist to explain science to the masses, is there? Ignore Fung’s text and look at Hall’s chart. EE rose from day 5 – 10, then crashed. Hall discusses this in his paper. You question Taubes’ credentials–what are yours? Richard Bennett, you state that “EE rose from day 5 – 10, then crashed. Hall discusses this in his paper.” I wondered about this and so went to the source material. You are right that EE rose and then dropped again, but it *did not drop below the original base line*. Throughout the trial, EE remained higher than the baseline taken while subjects were on a Standard American Diet. The difference between EE post-crash and baseline was not statistically significant. And what pharma company do you work for!!! You’re a kidney specialist – what gives you the special knowledge to advise people on obesity and weight loss? I eat only one meal a day. For breakfast, I eat one pound of raw beef and 6 raw egg yolks. I have no blood sugar issues and have never felt better. I’m 71 years old and had open heart surgery 4 years ago to repair an aortic aneurysm and replace a worn out aortic valve. I’ve been zero carb ever since. Most physicians I work with are good people wanting to truly help people, but going against convention causes a lot of problems raining down on their head. Real evidence needs supported and pushed ahead. Hello Dr Fung and thank you for a great article. I do feel, however that you need to update you information on Hormone replacement therapy as you are providing outdated information. When you make statement like HRT has “no benefit” that is extremely detrimental to women suffering in the menopause transition. Hormone replacement therapy does not cause heart disease and cancers in the simplistic way that you describe. As an obstetrician gynecologist I fight misinformation about hormones all the time. I am disappointed to see it here. I really wish Dr Fung would devote some of his time to speaking with politicians in Canada, or at the very least, Ontario in order to get the education to where it really counts: In schools. Right now, children in this country are being put on track for severe health problems. Childhood obesity is at an all time high and it’s got to stop. How embarrassing. I see they are all published. Didn’t realize that the order was new comments at the bottom of the thread. My sincere apologies. I’m a bit fascinated by the different responses. It is an interesting time to be in medicine for sure. Well said, Dr. Fung, well said! My thoughts exactly. Thank you, Dr. Fung. My personal quest for over 45 years, except for bearing children 3 times, has been to make choices to keep me away from the clutches of the doctors. …BTW, I’m on day 4 of a fast, thanks to your book, and doing OK. While I get Dr. Fung’s point I think he is being a bit disingenuous. These de-bunkers don’t do it for the “science” they have monetized their debunking. It is no different than Dr. Fung wanting his thoughts to be right because he has monetized them and makes money off it. If Dr. Fung was proven wrong on any of his theories would be he so easy to change? I doubt it. It isn’t about the science necessarily it is foremost about his status and industry and THAT my folks is killing medicine. We like to honor several other world wide web web-sites around the internet, even though they arent linked to us, by linking to them. Below are some webpages worth checking out. I’ve come to appreciate that fasting is agnostic to what I’m now calling “Food Theology”. Wonderful story, reckoned we could combine a handful of unrelated information, nevertheless genuinely really worth taking a look, whoa did one find out about Mid East has got more problerms also.